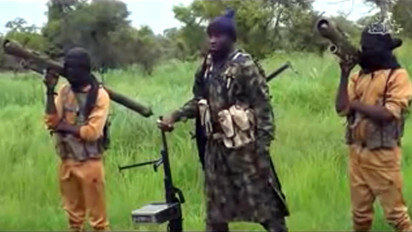 This screengrab taken on August 8, 2016 from a Boko Haram video released by the Nigerian Islamist extremist group Boko Haram and obtained by AFP shows Boko Haram’s shadowy leader Abubakar Shekau as he appeares in a new video vowing to fight on, shrugging off an apparent split in the hardline jihadist group blamed for thousands of deaths since 2009. “I… Abubakar Ash-Shakawy (Shekau), the leader of Jama’atu Ahlissunnah Lidda’awati Wal Jihad, made it a duty for myself (to fight) Nigeria and the whole world,” Shekau said in the video released on August 7, 2016, using the group’s name since it declared allegiance to the so-called Islamic State. Vanguard DSP Victor Isuku, the Police Public Relations Officer (PPRO), said in a statement issued in Maiduguri that the insurgents unconditionally surrendered to men of the command. “On September 10, at about 21: 00 hours, the intelligence arm of the Special Anti Robbery Squad (SARS) of the command, were able to negotiate a peaceful surrender of repentant Boko Haram terrorists with their families. Isuku said Bukar and Modu were from Ngallamari village and claimed to have been held hostage by the sect sometimes ago and were conscripted. He listed other surrendered insurgents as Alhaji Ali, 25; Abubakar Mele, 30; Modu Umar, 20; Modu Maina, 15; Ali Kolo, 20; Bintu Abukar, 14; Falmata Abukar, 15; Hauwa Ali, 15; Husam Ali, 14, and Mallam Modu, 16. Isuku disclosed that there were five children among members of the families of the repented insurgents, explaining that the children aged between one and eight years. He added that the surrendered insurgents had made useful statement that would assist in the counter-insurgency campaign.